There are 102 posts in this thread, and it has been viewed 29364 times. Well the purpose of this thread is to share information and tips about this cellphone. I personally am really pleased with it and I think its the best phone that I have owned. How many of you guys own an IPHONE? I got the slightly older iphone 3G 8GB and I got it second hand from a friend to a really good price. Which version do you own and have you owned more than one version of iphone? Do you experience any differences between the versions? Personally, I don't own one myself and have no plans to in the near future, as I'm not big on touch screen 'peripherals' etc. BUT I am a BIG Apple fan/user, so it's surely only a matter of time before I succumb to the apparent genius! What kind of cellphone do you own Ninja and RiKo? The SNK (well kind of) games I found so far for the iphone are Puzzle bobble and Magical drop. I own 2x Samsung SGH600's (one I use, and one is boxed new and unused... just in case). I don't think it's the greatest phone ever or anything. I've had Samsung phones since the D500 slide phone through, D600, D900, U600, E800 & finally G600. The G600 is the best of all those before it and as such, after having it 18+ months I'm VERY comfortable with it PLUS it does evertyhing 'I' need a phone to do. I have a 2nd is that I was out of contract and found a good site for mobile deals I chose to go with called Mobiles.co.uk. This site offers many deals (free PS3, 360, Laptop etc). I went for a deal that included a new G600 and �300 cashback! I thought why not, and got that deal. It was a good contract too! Those ports look pretty cool, but I don't see Mega Man 2 working on the iPhone. The NES games were hard as hell already and I don't see anyone beat that stuff easily with the touch screen controls. Streets of Rage and Sonic look pretty good though on the iPhone! i don;t like the way they put the controls on the screen, the phone would be better with a pull out section with controls on it. cos either u get a tiny screen like SOR or you obsucre the view. its nice to have those game on your phone though. Maybe this is a solution for you RiKo? That's pretty cool that you can add joypad controls to the iPhone. I don't have an iPhone myself (or any other mobile phone) but I'm not sure I would like using touch screen controls for playing games all that much. Priest have you thought about using emulators on your iPhone? Mame has been ported to the iPhone and I read that there are other emulators too like Mega Drive, Snes and Nes. You can of course play Mame with touch screen controls but also it's possible to use a Wii Remote. Yea I�ve been thinking about installing Mame on my iphone and now that you shown me there�s another way to control the games, it makes me even more interested. I think I am going to have to be careful... I just upgraded my phone and the 16gb iPhone 3GS is going to be here tomorrow! I really can't wait but the careful thing is because I could very easily end up spending way too much on apps lol. Really looking forward to it, and I can sell my current phone for �120 too! So Kaz, do you currently have a iphone 3G? If you do the please do a comparison between the two phones, cos I need to now is the 3GS that much better than the 3G? Yea you should get Streets of rage. I got Golden axe too, this has some terrible slowdowns though, unlike the MD version. 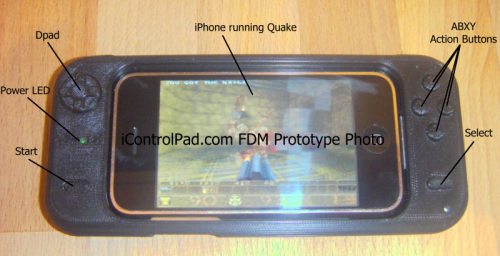 that looks interesting those add ons Priest,, maybe they will do a thing like the new PSP has for future Iphones where the controls slide out. I don't currently have any other iPhone, but I have used a friends 3G a little, and according to him the new one is definitely faster and has some needed features (video recording for instance) but in his opinion it's not quite enough to warrant paying a lot of extra money for unless you are a huge iPhone fan. I could have got the 3G on a cheaper contract than the 3GS but I figured that I may as well pay the extra to get more talktime and unlimited texts and a better phone seeing as this is my first iPhone. I had some links that I can dig out that show video footage of the speed difference etc if you are interested? Kaz: OK I can understand that if buying a completely new iphone you choose to pay a little extra to get the latest model (3GS). I�m really satisfied with the iphone and I hope that you will be too. Yea I�m interested in that comparison, thanks. My iPhone was delivered yesterday but no-one here to take it, so it's back at the depot... I have to go after work to collect it tomorrow. NOOOOOOOO! I just read through the thread properly and just saw that you mentioned Magical Drop Touch! Holy crap I didn't know about that, I just bought it as it was only �1.79, and the reviews are good so it's a bargain... I'll have to knock out a review for the game after I have played it (when I finally have my phone lol). I have downloaded a ton of free apps so far to mess with, but I also bought Doodle Jump because every iPhone should have that soul sucking piece of addictiveness , and I also downloaded Rock Band... which is actually very good on the iPhone, I played it on my friends. I want to be careful though because I know I could very easily spend a stupid amount of cash in the iTunes store! Any other recommendations for interesting free apps?